With 45 knots of breeze blowing across Whitstable Bay on the Friday and with more to come forecast, it wasn’t surprising there was a reduced entry of 24 boats for Whitstable Yacht Club’s annual Silver Tiller meeting over the weekend of 23 – 24 June. Despite having to run the racing from a RIB, following the sad loss of the club committee boat in a storm, Jon Silk and his race team were determined to get two races in on Saturday. A rather nervous fleet launched into a solid Force 5, gusting 6. With Salcombe Week only two weeks away boat and body damage was to be avoided and several crews elected to stay ashore. – Tough to work out which way the wind was going to veer. The fleet were initially driven left which didn’t pay. Unusually at Whitstable, those that went right gained but playing the shifts seemed to be the key. Andy “Taxi” Davis rounded first followed by Tom Stewart and then us. Judith Massey was in the mix with Will Rainey and Dave Winder. The first reach was tight with the tide – not all could hold kites. – There was significant carnage at the first and subsequently every gybe mark – the chop made gybing difficult as the main was powered up through the gybe! – On the second reach Taxi had spinnaker problems and dropped places. Tom Stewart lost it and spun out for a big swim but we (Andy & Phil Dalby) managed to keep it together to the end of the race to take the win. Sailing deep on the runs with the tide was advantageous. – Dave Hayes arrives with main sail. – I (Andy Dalby) fell out of the boat – long swim trying to get back in within the 5 minutes. – Off the start it paid off for those who went left out of the tide – but the wind was still shifting. – Carnage at the gybe mark again – Casualties included Dave Hayes, Dave Winder and us. – Taxi’s main halyard failed on second beat. – Tom Stewart pulled out a comfortable lead with William Warren, Will Rainey and Judith Massey in pursuit. – Dave Winder and the Dalby’s recover to pull back into the race crossing each other up the final beat. Dave Winder does very well to get up into 3rd with a snapped and trailing spinnaker pole. One competitor summed up conditions succinctly –”chuffing windy”. Most people had at least one swim and the relatively light damage (one spreader bracket, one spinnaker pole, a deck sheave and lots of burgees) speaks volumes for the robust construction of the modern Merlin and its rig. Sunday morning dawned with more of the same and a postponement was signaled. However with over 30 knots being recorded on the harbour wall racing was called off for the day. So the winners of the Holden Cup for the Craftinsure Whitstable Silver Tiller were Andy and Phil Dalby, their first ever Silver Tiller win. 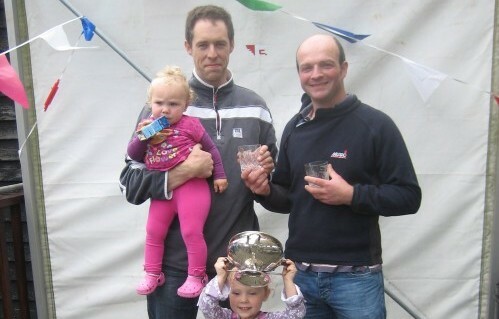 Dave Winder and Pippa Taylor were second overall with William Warren and Chris Robinson third. The “Man of the Match” award must go to Joe Tosh, aged just 13 years and a day who, crewing for dad in “Cool Cookie”, completed both races. Well done Joe! Photo: shows Andy and Phil Dalby with the real Dalby sisters and the Holden Cup.